As April morphed into May and last minute jobs were completed we began checking the weather for a window to cross the Gulf. A forecast for West 25 - 30 looked promising and the following few days would be helpful too and so a date was set. 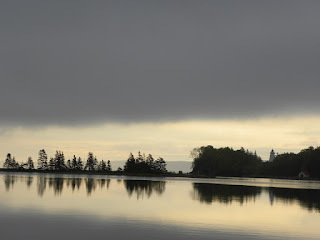 We rushed up to NE Harbour by car rather than sail to see Phil and Helen, met a last few interesting people on the dock and finally slipped our lines early one morning for Pulpit Hbr. We've always tried to find a quiet place to head out from as it gives us time to get our heads together plus allows us a small shakedown to get us into the rhythm. This time with a stiff head wind we opted to motor much of the 20 miles to make sure all was well with the engine. And it was. Or at least until the last 4 miles when it cut out minutes after we had slipped through a narrow gap between a couple of rocky islands. As we had sail up we simply carried on sailing and once clear had a quick go at starting it. Of course it started but this was beginning to be more than frustrating. We sailed into Pulpit, with the engine ticking over until we needed it to back down on the anchor. It performed without a hitch. Hmmm. As we'd been ticking over for a while I revved it hard to clear the "tubes" and on the final rev it cut out. 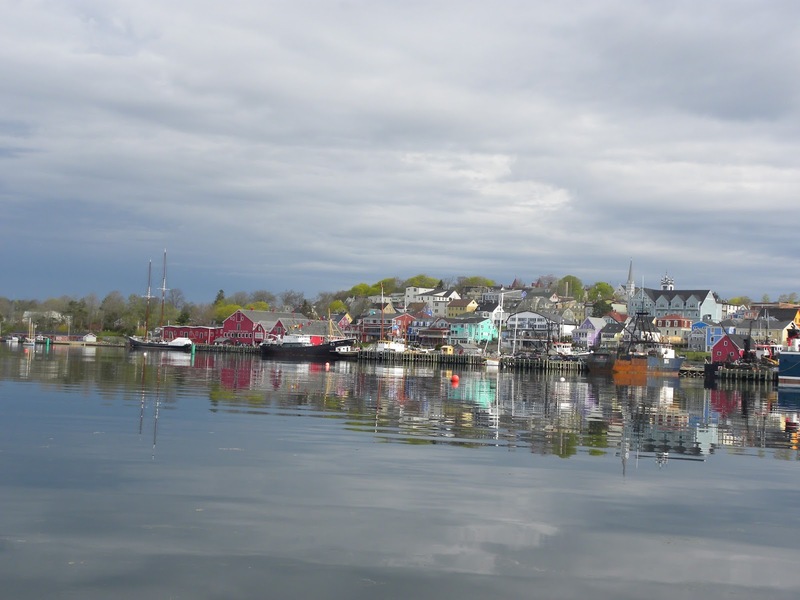 Ordinarily we would have abandoned the trip across, returned to Belfast and sorted the problem out but the weather window and the chance of getting delayed beyond our May 31st deadline decided us and the following morning we left Pulpit for Lunenburg. As we hadn't sailed anywhere for 5 months or so we reefed right down and then decided to use the trys'l anyway as with the 30 knots forecast we would still maintain good speeds without needing to worry about a preventer on the boom. In the event the wind speeds were more like 20 than 30 and within a few hours we'd changed to the main and soon removed a reef as the winds eased even more. 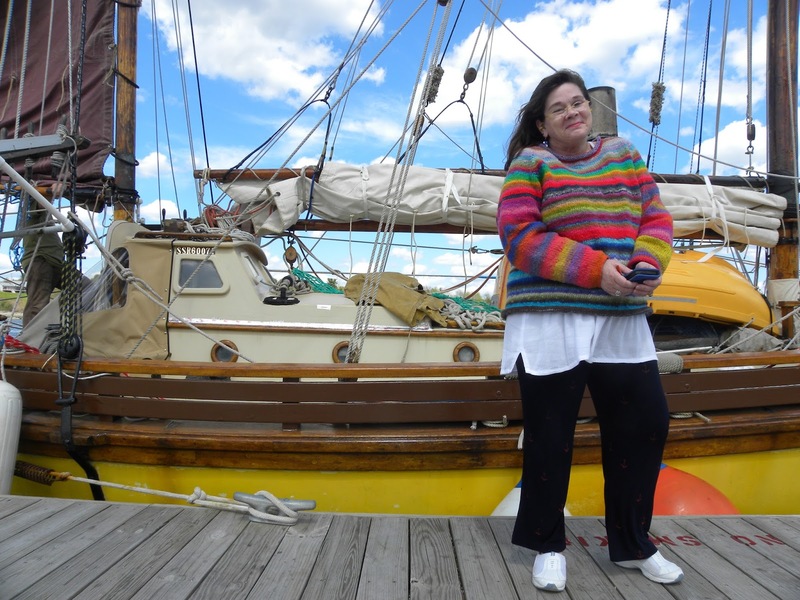 The trip across was uneventful other than dodging lobster pots which continued until about 20 miles from the border between the US and Canada. As we crossed we began to get our towing generator ready to deploy but found ourselves coming across Canadian lobster pots and gave up on the task as a 50metre line with a small prop on the end is bound to become entangled and get wrecked. Cape Sable is always difficult to get right when coming from any distance away and this time had us arriving as the tide turned against us. We were far enough out, about 15 miles, to miss the worst of it but as it turns favourable earlier closer in it you can't stay too far off. Of course the wind died or at least became very light and we resorted to hand steering in an effort to squeeze more miles and make Lunenburg at a reasonable time. At one point with Hannah bowling along at 6 knots we seemed to be on target for an early morning arrival but it never lasts of course. By the time we got within 20 miles of our destination it was late afternoon and the wind finally gave up and our speed dropped to 0.7 k and we switched the engine on. Of course nothing happened. Before we got to work on it we called the Coast Guard to see if we could get the OK to anchor in a nearby bay rather than try to work our up to Lunenburg. After taking all the usual details the CG patched us through to the Customs and Immigration. They weren't too taken with the idea and asked us to notify them, via the CG, when we were anchored. Rather than mess with filters etc we just stuck a pipe into a jerry can leading it to the lift pump and dropped the return hose into the same can. Engine fired up, ran successfully and we started, slowly, for Lunenburg arriving about 11pm after Bee had done an amazing job spotting the local lobster pots in the dark. Even with our full keel we still get twichy about snagging these things so anyone with a fin keel and exposed prop must be having palpitations. 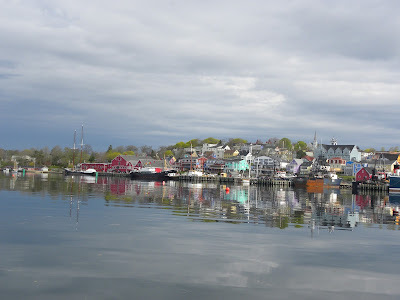 Still into Lunenburg we steamed, dark of course apart from all the town lights and we motored slowly up and down not quite believing that the town has not yet put out any jetty's for visitors to lie alongside. Not normally a problem for us as we anchor but the Customs guy's want us to tie up on the Government Wharf when they inspect us. Except that wharf is out of bounds as they're renovating...... after an hour we give up, not even the marina has a jetty out and we drop anchor, call the CG, get patched through to Customs and are told to ring again in the morning. We do, via Skype, and explain everything for the third time. We can see an empty wharf we can tie to but it will mean the Customs guy's climbing down a ladder to get to the boat. The voice on the telephone says fine, go there immediately as the officers are on their way. We motor over, get alongside and have some irate ticket seller for the charter boats come rushing over to say we can't tie up there. We do as we figure the Customs and Immigration trump a local misdemeanor. 10 minutes later they're with us. They look down 8 feet to where Hannah sits. "Can't we get the boat closer by removing the fenders" - we demur but offer to drag the stern closer by easing the bow. They agree and we comply but the number of ropes going everywhichway leaves them all a little uneasy. In fairness to them they were all pretty big guys bulked out with flak jackets and an assortment of matt black "weapons" dangling from their waists. In the end we were told to bring all our docs and come ashore and they'd interview us there. All civil and reasonably good natured and then we were free to go. A quick check around town, and then off to see John and Phyllis and get the engine sorted. We began by removing the hoses that feed the filters from the tank. Although we used a pump to blast air through little came out but poking a wire through revealed a fair bit of crud. Part of the system is copper tubing and a closer look at this revealed it was going an unhealthy shade of pink and that was cut and removed. The worst part was in the ball valve which turns the fuel on and off. Bee discovered a large amount of crud in there and we decided to scrap the lot and replace. The hose, barbs and shut off valve were duly delivered and eventually the job was done. We had intended to install an old Racor filter we had but couldn't cleanly work it into the system and ended up installing it into the hand pump we use to fill the tank from the jerry cans. This enables us to fill the tank at sea without opening the fuel filler cap. The jugs are in a cockpit locker, the end of the hose is inserted, the bulb squeezed a few times and fuel flows into the tank. Now it has it's own filter (which has been lying around since our Taylor's Cooker days). We went out to test everything, running the engine at 2000 revs and gradually increasing for long periods of time, even hitting 2800 (our maximum) and all without a murmur or complaint. Back on the buoy we did the oil change, changed an impeller and are ready to go. But the weather isn't. A brief period of SW, followed by a long period of head winds leave us unwilling to head off. 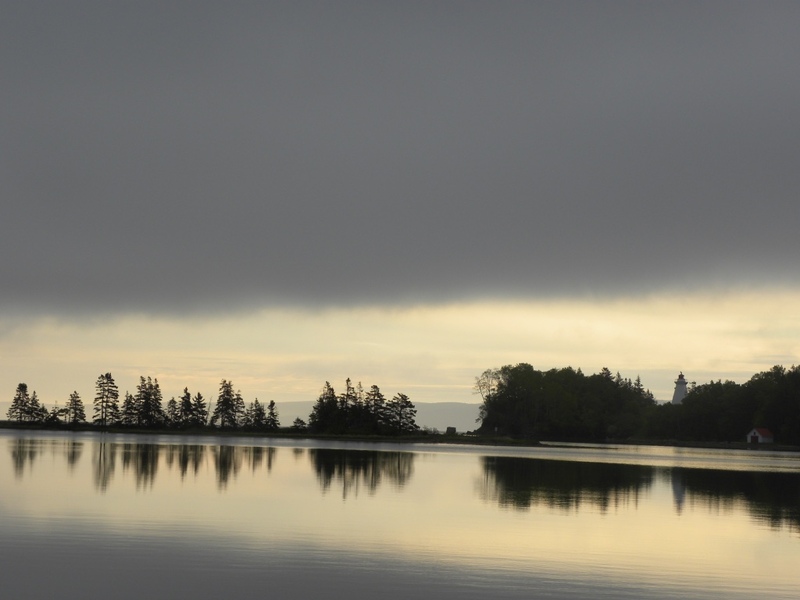 We ponder, mull, look at charts, wonder how much we're gaining by moving up the coast to Cape Breton and, for the moment, think we'll head for Iceland from here saving ourselves a detour around the Grand Banks. We "amuse" ourselves by helping out on Morgan's Cloud or painting over at Steve and Marilyn's. The work on MC is simply stripping and cleaning winches. The small ones, about the size of our largest, are easy and quick to work on. Not so the huge (to us) #65 which are complex and heavy. In total they have 13 winches but only two headsails whereas we have two winches and a possible 7 or 8 headsails. We took a day off and went sailing, something we rarely do. Day sails I mean. Not much wind but pleasant enough as we sailed quietly amongst the islands north of here. A few lobster boats gathering in their traps as the season would end in a few days but essentially the waters were ours. We had to motor at one stage as the wind was blanketed by an island but once clear we had a great beat back toward the mooring. It may be our imagination but since we had the new sail the boat slips along much better in very light winds and for the first time ever we have found ourselves pointing closer to the wind. OK there were no waves to knock us about but we were 10-15 degrees closer than we have ever been before. For much of the time we spent at John and Phyllis’s we were watching the weather, hoping we’d get enough days to knock off some miles and make a dent in the journey. As it became clear that more than two days of favourable winds for the trip to Iceland were unlikely in the near future we began to widen our thinking and find an alternative. Sometimes we (or really me) get fixated on where we are bound and miss the obvious. Which in this case was to break up the trip and, hopefully, go via the Prins Christian Sund in southern Greenland. This will allow us to get up to Fox Harbour in Labrador and then have a shortish 700 mile trip across to Julianehaab, Greenland. So when the winds came in from the SW we took off having said our farewells to two sets of good friends. Of course the 30 mile trip across to Halifax was slow as we rarely made above 4 knots but the following day was good and being 10 or so miles off shore we avoided most of the lobster pots. As ever the forecast didn’t quite live up to actuals and with the wind intending to switch to the NW we began the last section up to the canal. It turned into a beat and then a wet beat as the rain fell. With 4 miles to go we switched the engine on motored in. The staff, as ever, were friendly although we were initially mistaken for “Ironbark” which we accepted as a compliment! At the other end of the canal Jack and Glenda were waiting to greet us, refusing to believe our email that had said we wouldn’t be coming through this year. An all too brief stopover and the following day we were on our way again to anchor for the night in Maskell’s Harbour, where it is possible to end up completely landlocked in solitude. A wonderful stop. Maskell's, soon after we anchored..
We left early the next day and motored the 20 mile to the exit. The northern section of the Lakes isn’t as picturesque as the southern bits but we were eventually out into the ocean. The winds remained light but the promise was for very strong easterlies overnight. With this in mind we continued to motor-sail and arrived off the harbour entrance to Dingwall around 7pm in mist and rain. It’s a narrow entrance, a little more than 100’ wide with a bar. When a big easterly swell is running it would be extremely dangerous but the seas were small, much less than a metre, and we slid in between the welcoming breakwater overjoyed to have made it before the rapidly building clouds astern of us arrived. 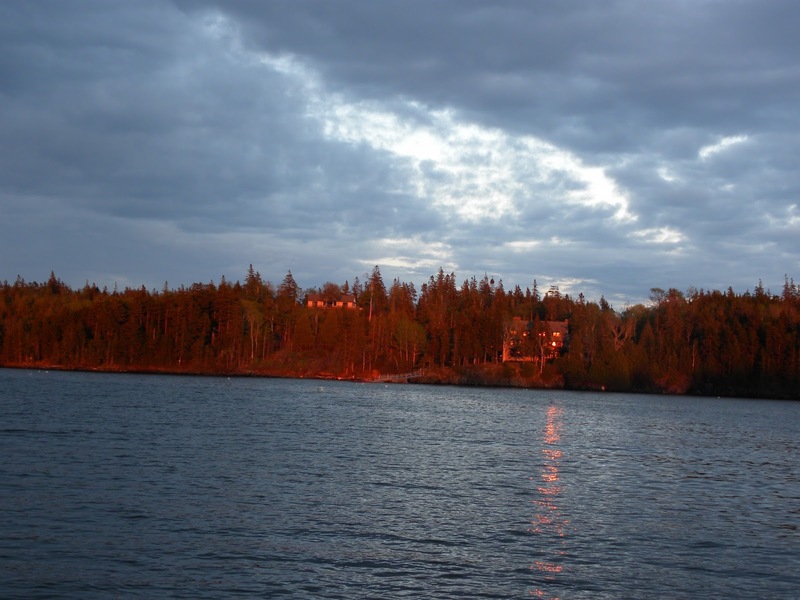 The anchorage is about 1/2 mile from the entrance, landlocked and completely sheltered - scarcely a ripple on the water, a definite hurricane hole. The following day no fishing boats left and we could hear the surf pounding onto the shore and knew why. A friend had seen us come in the night before and it was good to see him again after 6 years. We’ll lay here for a few days until wind changes to a better angle and then push on. A year ago we bought a second hand Pudgy. In the last couple of weeks we have got around to sailing it. The two of us can stretch out in reasonable comfort and, whilst it is not the speediest dinghy I’ve ever sailed, it is a delight. Stable enough yet it’ll still pick up speed with a small gust. 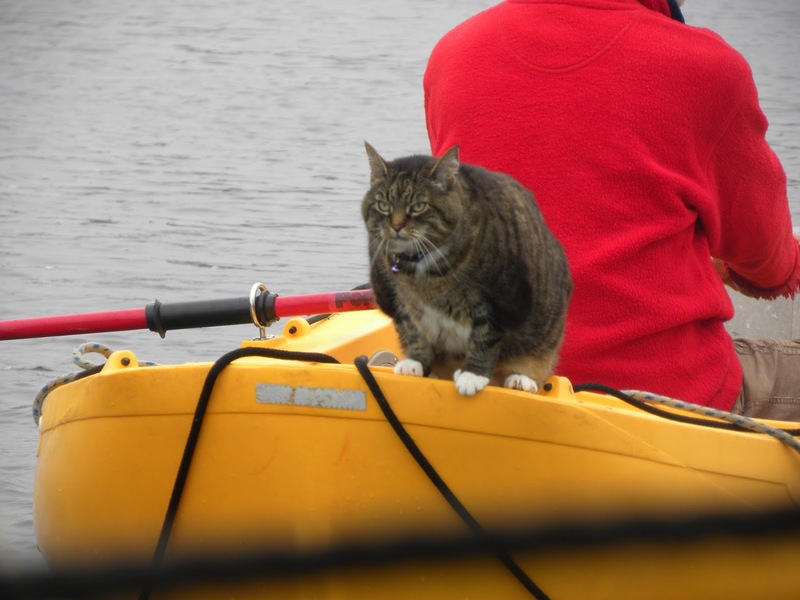 Even better from our viewpoint is that Toots has taken to it and will readily come aboard to be ferried ashore for a roam around. 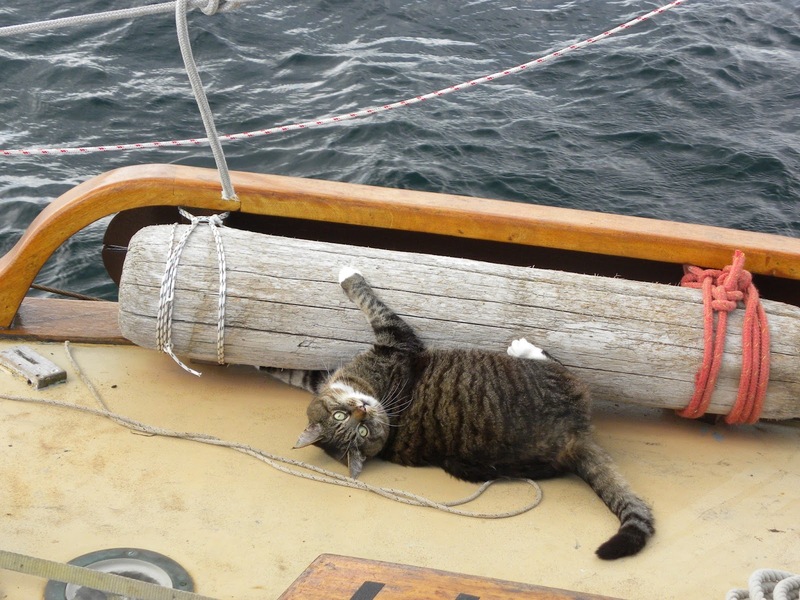 We haven’t, as yet, persuaded her that she should try the sailing rig. Are they expensive? On the face of it yes. BUT it does not require periodic inspection, at huge expense, for an item (your life-raft) you hope never to use….. You know when you dump it over the side to escape your home that it will work because you’ve been using it regularly to row ashore or pleasure sail around the anchorage which represents genuine value for money. Anyway, it's our choice on the matter and we're very pleased. And finally. For years we have carried a small log on our foredeck. Casual visitors aboard; always comment on it, querying its purposeand inevitably guess it to be some sort of esoteric gaffer fender. 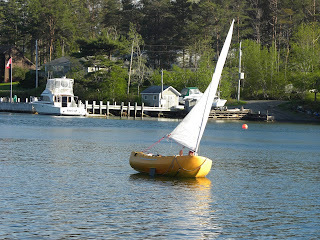 We picked it up in Rockland Harbour in 2004 and it has remained in the same place ever since. Well here's the reason we carry it; nothing nautical.